Constructed from 12 mm tongue & grooved shiplap on 45 mm x 34 mm planed framework. Floor & roof are also T&G fabricated. The door is frame ledged and braced, secured with a lock and key plus 3 hinges. The window section can be fitted on either side while the door is left-hand hung. Double-doors’ option available on 8’ x 6’, 10’ x 8’ or 12’ x 8’ models as an extra. 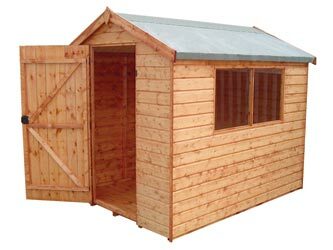 Although installation can be arranged, Premier's flat pack sheds are easy to assemble and supplied with fixtures, fittings & roofing felt. London-trade Sheds are pre-treated with a russet-brown preservative as standard. These garden buildings certainly represent exceptional value. Window Size: 18" x 24"